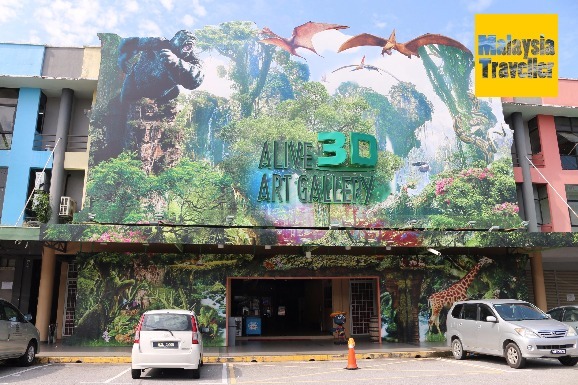 Alive 3D Art Gallery is one of those interactive trompe l’oeil art galleries that have become very popular in Malaysia in recent years. The first one I saw was the Trick Art Museum at i-City. This one at Port Dickson has a similar concept and is bigger, according to Alive 3D’s Manager, Mr. Dino Yeong. As mentioned visitors can interact with the paintings which have been skilfully created by the artists to appear as though they are 3D. Visitors are required to get into the spirit and pose as if they are part of the action portrayed in the paintings. Needless to say, you will be able to take some fun photos for your social media. There is a shop where you can buy snacks and souvenir items such as T-shirts, cups, key chains and so on. Most people seem to enjoy the gallery and give it favourable reviews. TripAdvisor rates it as one of the top things to do in Port Dickson. The gallery is owned by the Segar group, a property developer. The opening of this art gallery and the neighbouring Wild West Cowboy was no doubt an attempt to breathe life into one of their developments, Bandar Dataran Segar in Lukut, on the edge of Port Dickson. The place can get busy at weekends but if you can go during a weekday you will have more time to pose for your photos without inconveniencing others. No. 38-40, Jalan DS 2/1, Bandar Dataran Segar, 71010 Lukut, Port Dickson, Negeri Sembilan, Malaysia. Wild West Cowboy Indoor Theme Park is just a few doors away on the same street.